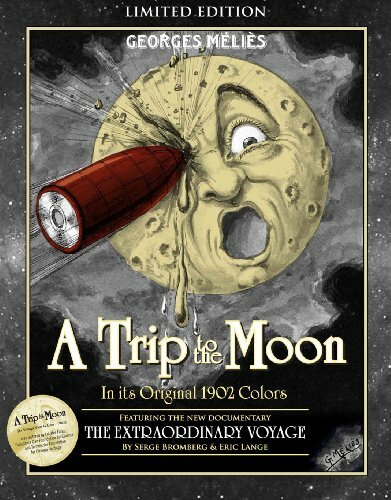 No original hand-colored copies of A Trip to the Moon (Le Voyage dans la Lune - 1902), by Georges Méliès, had been known to survive until one was miraculously found in Spain in the mid-1990s, but in a fragmentary condition thought too fragile to handle for either viewing or restoration. In 2010, three experts in worldwide film restoration - Lobster Films, and two non-profit entities, Groupama Gan Foundation for Cinema and Technicolor Foundation for Cinema Heritage - launched one of the most complex and ambitious film restoration projects ever to bring an original, colored version of Méliès masterpiece back 110 years after its first release. Using the most advanced digital technologies now available, the team reassembled and restored the fragments of the 13,375 frames. The two foundations, which carried out specifically the music part of this project, decided to approach AIR s Nicolas Godin and Jean-Benoit Dunckel, to compose an original modern soundtrack to accompany this cinematic milestone. Packaged in a limited-edition, SteelBookTM case, this publication also features The Extraordinary Voyage, a fascinating new documentary, directed by Serge Bromberg and Eric Lange, which chronicles the journey of A Trip to the Moon from the fantastical Méliès production in 1902, to the astonishing rediscovery of a nitrate print in color in 1993, to the premiere of the new restoration on the opening night of the Cannes Film Festival in 2011. The documentary includes interviews with contemporary filmmakers, including Costa Gavras, Michel Gondry, Michel Hazanavicius, and Jean-Pierre Jeunet on Méliès enduring significance to cinema. If you have any questions about this product by Flicker Alley, contact us by completing and submitting the form below. If you are looking for a specif part number, please include it with your message.